Online trading firm launches new brand campaign to demonstrate the emotions experienced when trading. IG, a global leader in online trading has launched its first global brand campaign. Running in 11 countries around the world, it is intended to position IG as the first choice for active traders across the world’s markets. The campaign was created in-house by IG’s own advertising team, with the TV creative directed by Rupert Cresswell and produced through MPC Creative, who previously worked together on advertising for Bentley. The TV ad was shot on location in the Atacama Desert in Chile and saw the team working around the region’s largest snowfall for over 50 years. 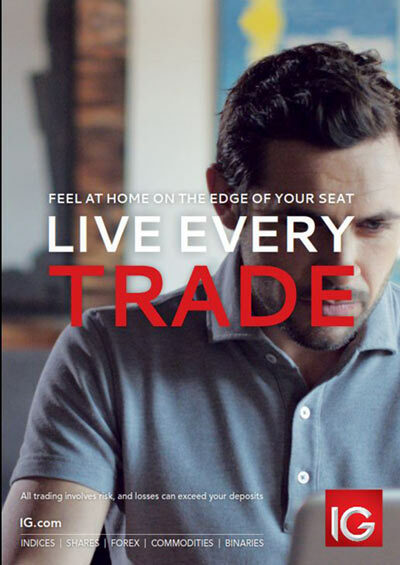 IG is leading the financial trading industry by running a campaign that illustrates the range of emotions experienced when trading, driven by the tagline ‘live every trade’. John Ayling & Associates have handled media planning and buying in the UK, which will see the creative run across a number of platforms including TV, digital outdoor, online and press. IG is the first company in the UK to buy digital outdoor advertising during peak travel hours to reach commuters.